There is no better place to network, learn, and make connections than at fun spring event filled with people who have ambitious entrepreneurial goals! At the IdeasVoice event, attendees will have the opportunity to exchange ideas with talented entrepreneurs, share experiences and advice, and initiate a fruitful collaboration in an enthusiastic business venture. The structured evening will leave eager attendees with further insight on how to reach their goals. 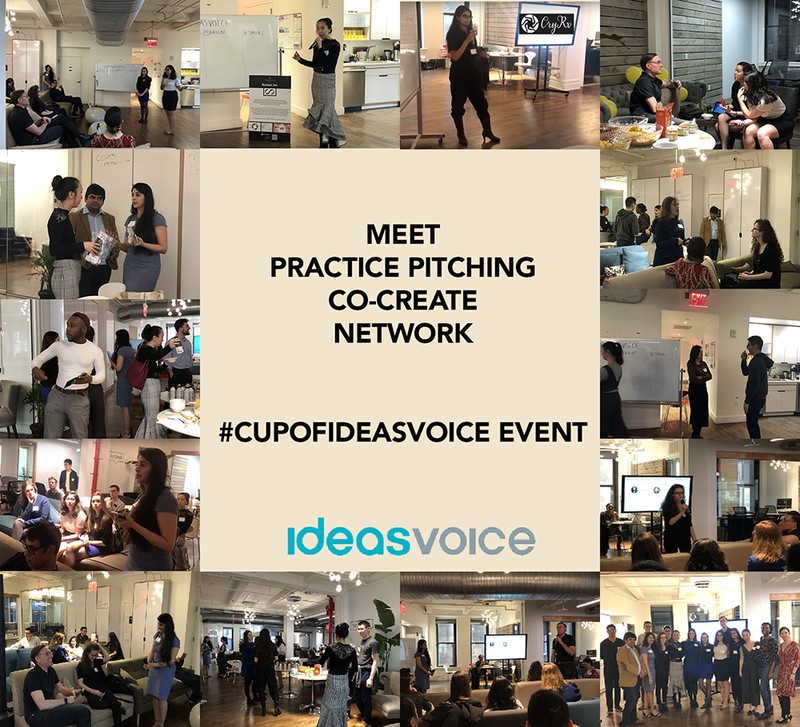 With spring arrival, we hope that many projects will bloom at the NYC Cup of IdeasVoice event for matchmaking between entrepreneurs and those wishing to join a startup as well as investors! 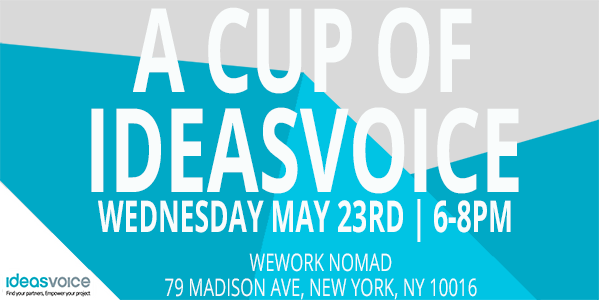 CUP OF IDEASVOICE provides entrepreneurs with a unique opportunity to conduct insightful conversations to understand whether they feel passionate about the same idea. Are you a FOUNDER with an ambitious project ? Are you looking for a co-founder who is engineer, CTO, manager, business developer, CFO ? Register to present your project to the attendees! Post your project on the website before the 30th of March to inform IDEASVOICE community. Are you a future CO-FOUNDER with technical, finance or business skills ? Are you eager to be committed in a startup ? The world is changing rapidly and competition is stronger than ever. You cannot sit idle or continue to simply follow your peers. In order to be successful, innovation and speed to market are crucial. Business Models Inc. helps organizations and teams stay ahead and help you win. Description of prize: In your session with BMI you’ll learn how to use the Business Model Canvas, apply innovation techniques, tips, and tricks to your business model, and develop value propositions for your customers. Rooney Nimmo specializes in assisting and advising startups on all aspects of business law, guiding founders through the complete life cycle, from formation, fundraising, and the scale-up process, to exit, via the firm’s busy M&A practice. The firm counsels clients on everything from venture capital, intellectual property, employment law, and equity comp, to contractual work, taxation, immigration and real estate, often working hand in hand with founders as a de facto general counsel. Representative clients of Rooney Nimmo include organizations as varied as Aberdeen Asset Management, Her Majesty’s Government, The Economist, Ocado, adMarketplace, Outfront Media Inc., and NTT Communications Corp. Description of prize: A free one-hour consultation with a Rooney Nimmo attorney to discuss anything from corporate legal matters to immigration to intellectual property. Time to be arranged between you and the Rooney Nimmo office. Venue Midtown East. Laconia Capital Group (LCG) is a full-service venture firm, with a family of funds and a venture asset management company. The core values of transparency, collaboration, and community are central to all aspects of our business. Our venture funds focus on late seed-stage B2B software companies based in Northeast major markets. In addition to the funds, Laconia operates a bespoke investment advisory service for family offices to develop and execute a comprehensive venture capital investment strategy through Laconia Venture Asset Management (LVAM). Description of prize: One-hour mentor meeting with Geri Kirilova (Laconia Capital Group) to discuss any questions relating to fundraising, capital strategy, and business development, among other possible topics​. Could also use the time to work on a founder’s pitch/story (both verbal delivery & PowerPoint presentation). Michelle McLin is a professional with 20+ years in product development, product management, and product marketing experience. Michelle has a passion for growing consumer products and services in mobile, media, and digital platforms; and has worked with companies like Comcast, Verizon Wireless, Aetna, and Digitas. Michelle has also worked with startups to develop business plans, raise capital, and market entry strategies. Michelle drives product initiatives from ideation all the way through go-to-market implementation. Michelle is the principal of marketing consulting firm, Acuity Advisor and an adjunct lecturer at New York University (NYU). Meg Luce is a strategy designer at Business Models Inc. At Business Models Inc, she develops strategies and designs value propositions for organizations of all sizes across industries. Meg has been able to find the balance between thinking like a business, and thinking like a designer, and has helped organizations alter their mindset in order to become more profitable and innovative.